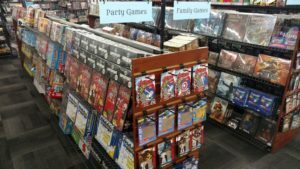 Board Games | Millennium Games | Over 1,000 Games! If Millennium Games has one unique feature, it would be our dedication to board games. With over 2,000 unique titles in stock, we carry games for every genre that could be imagined, and for every skill level of player. 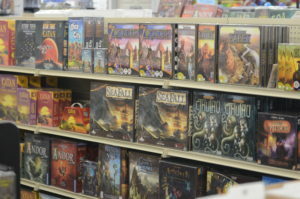 Our selection is so large, we have entire aisles dedicated to one genre of game. Take a look at the different selections we have below, and please remember – these are just examples of what you will find in our store. Some of the games listed below are our favorites, but you really have to come into the store to see how many different titles we have to for each genre. New Releases – This aisle features the hottest games of the last three months. We keep extra space for our new releases so that we can stock them deep and have a copy ready for you when all the other stores are sold out. It is common for Millennium Games to have copies of a game when even the online retailers are empty. Pop Culture and Classic Games – Those games that you grew up with are here, and we make sure to carry both the classic versions of your favorites from Milton Bradley, Parker Brothers and Avalon Hill, but also new renditions that are tied into the most popular themes of today. Trouble, Sorry, and Scrabble may have stayed the same, but Yahtzee, Risk, Monopoly, Clue and others get a new spin when you add the likes of Harry Potter, Doctor Who, Game of Thrones, or The Walking Dead. 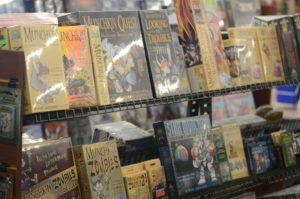 Steve Jackson Games specializes in Munchkin. Steve Jackson Games – The time honored tradition of stabbing your friend in the back right as he is about to win has come to define the game Munchkin, and Millennium Games has over 100 different products for the treasure hunting folk. We carry so many versions of the game, that you will need to cheat with both hands just to carry them all. Steve Jackson also brings you great tongue-in-cheek humor with Illuminati, Chez Geek, Zombie Dice, and more. Cooperative Games – For anyone who has friends that do not want to lose, our Cooperative Games sections puts the players against the board itself, instead of each other. A great section for families and all very easy to learn since everyone is working towards the same goal. Some of the best known cooperative games include saving the world. Help prevent a global health crisis with the Pandemic series, run for your lives from the horde of flesh eaters in Zombicide, or delve into the eldritch mysteries of Arkham Horror. We also feature a special section of Cooperative games with a traitor element – Everyone looks like an ally, but secretly someone is plotting your demise as they lie through their teeth. Outrun the Cylons of Battlestar Galactica, quest for the Holy Grail with Shadows over Camelot, and fend off the haunting specters of Betrayal at House on the Hill. Our Family and Party section contains games that go up to 8 or 10 players – perfect for holidays. Kids Games – As a parent, one of the hardest things to do is play a game that a young child will understand, and stay awake during the game. Our kids games will give you something you enjoy so much, you might find yourself playing them when the kids are not even home! These games will start as young as 3 years old with Go Away Monster, Animal upon Animal, Quack a Doodle Moo, and Pie Face. Once they understand the basic mechanics of games, you can wean them into little strategists of their own with My First Stone Age, Catan Junior, Dr Eureka, and My First Carcassonne. Best Sellers – This is our bread and butter. Whether you have been playing board games for 1 year or 10, you have probably played, heard of, or desire these award winning titles. Almost every title in this section has won some of the most prestigious awards in our industry, culminating in the coveted Spiel des Jahres game of the year award. There are so many here to choose from that this entire page could start to list them. The standouts include Settles of Catan, 7 Wonders, Ticket to Ride, Carcassonne, Dominion, Puerto Rico, Takenoko, Power Grid, Tsuro, Stone Age, TIME Stories, Tokaido, and Scythe. 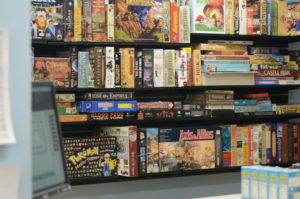 Used Board Games – Our used board game section includes over 200 titles starting in the 1970’s and ranging all the way up to brand new titles. Most of our board games are 50% less than the retail price of the game, and many were printed in the last year. We also accept board game trade-ins. Bring in a board game in good condition and with all the pieces, and we will offer you store credit towards you next purchase – our store credit has no restrictions, so you can use it to purchase anything else in the store.